When Bruno is happy you know it! Having moved to this side of the world, I have often been told to embrace the grey, to be less direct and just wait a bit longer. Which is OK. It is part of moving cultures, becoming more globalised and it’s not a bad thing to be able to slowdown.. sometimes. And I have to a certain degree. But why say yes if you actually mean no. Why not say it’s a 10 out of 10 if you are really happy, instead of hiding your opinion because…well because of what I am actually not too sure. It seems a certain concern of not wanting to stand out, of rather blending in into average opinions then showing your own. Wouldn’t it be great if all humans had a dog’s tail that shows what one really means? It would cut so much confusion, so many wasted meeting hours, and add so much joy to the world. I love the food, yay wag that tail! I am content and comfortable, just keep the tail half-mast. Dogs could be Dutch. There is really no mistaking when dogs are happy or sad. The tail tells it all! Its wagging like mad or it hides between its legs. A dog cannot say ‘sure it’s fine’ and mean ‘I hate it’. And they’re so practical. When it’s a hot summers day they will lay down in the shade and save their energy, when it’s dark they sleep, when there’s food, they eat. Very black and white, very direct and very practical. Maybe that’s why I love dogs so much. 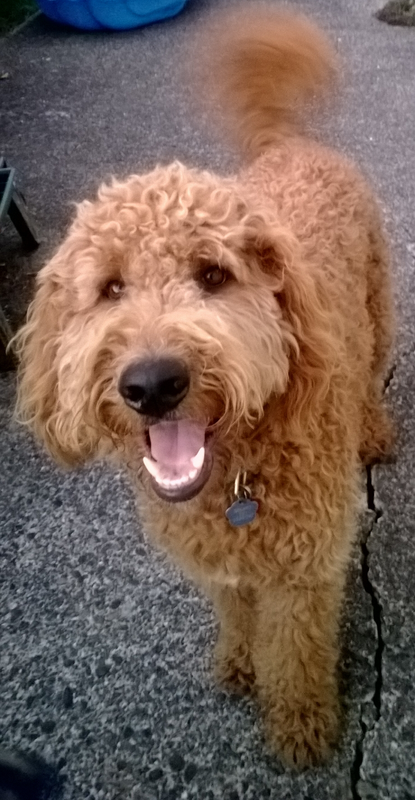 This entry was posted in A to Z challenge and tagged Bruno, direct, dogs, happiness, tails. Bookmark the permalink. I’d be too afraid of letting people know my real thoughts if I had a tail. I’d want to hide it. Actually I just thought, we’d need to have tail fashions, like gloves or boots. Can I have a yellow tube, please? At least it would stand out against the grey days, then. it would be scary, and fun at the same time! maybe we can have one tailday a year to try it out! hi Carole. Its not a feeling, i have actually been kindly advised a few times 🙂 . you’re right though re the relativity, it all depends what you take as the norm! thanks for your comment! Second, I’m a cat person. But I catch your drift. Although a tail wouldn’t be very practical in humans. We’d be watching each other’s backs all the time. On the other hand, figuratively speaking, shouldn’t we all? Hey Peter! Yes, actually haven’t written for fun for a while. This challenge is pretty great for it! Are you, and if yes, what’s your blog? Love cats too, although never had one. With a tail you could watch someone’s back by just facing them, wouldn’t that be great? I can tell you about it, but you’d have to DM me (been following you on Twitter). It’s okay if you don’t, I’ll just post a comment now and then. Cheers! LOVE this post! And right you are!! !